Jaundice (newborn jaundice) is a disease in which there is an appearance of yellow color in mucous membranes or eyes. Yellow color in jaundice is basically a yellow pigment which is from bilirubin.It is a byproduct of body’s old red blood cells. 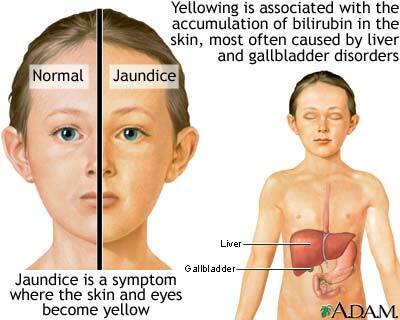 Jaundice may also be a symptom of many other disorders. This article will tell about jaundice in newborns and children. It is a common situation observed that whenever there is a cut or bruise on a body, our body gets series of color changes during its healing process and the yellow color in the bruise is due to bilirubin. Some doctors say that jaundice is not a disease but a sign of many diseases. The color of the skin generally varies which depends upon the levels of bilirubin.When there is a high bilirubin level, the color of the skin turns brown but if bilirubin level is mild, the skin color will become yellowish.Generally, about 1% of the red blood cells of our body die everyday and they are replaced by fresh red blood cells. Newborn jaundice suggests that as newborns make amount of bilirubin than adults and so large amount of this bilirubin is reabsorbed from the newborn intestine before the infant gets rid of it in the stool.